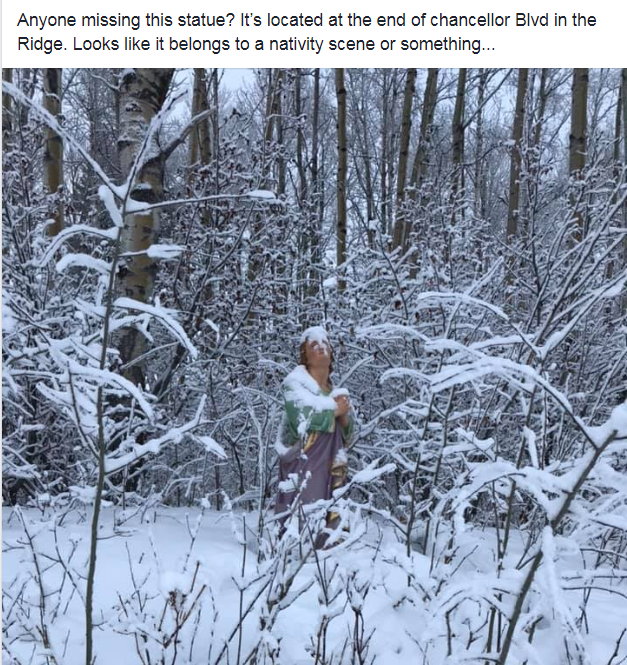 A historic statue, stolen from a Lheidli T’enneh church, is now safe and sound at the Exploration Place after a strange journey around the city. 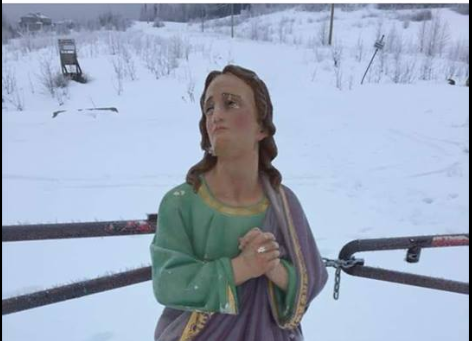 The statue, which lived in the over 100-year old St.Pius Church on the Shelley Reserve just north of Prince George, was taken sometime in the last few weeks. It was rescued just yesterday from behind Walmart after multiple postings on social media show it in different locations around town. 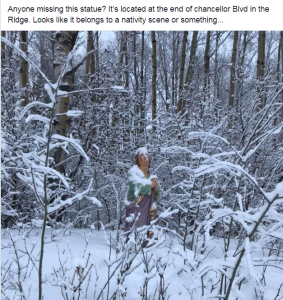 No one seems to know how long the 4-foot tall effigy was on its pilgrimage for, but Tracy Calogheros, CEO of the Exploration Place, said she’d heard from museum staff that sightings of the statue were being posted just before Christmas. It seems the thief, or thieves, were neither in the heist for financial gain nor to destroy the statue as it was relatively undamaged when museum staff went to pick it up. Joshua Seymour, who lives on the Shelly Reserve, said he doesn’t think that anyone knew the statue was missing until it was found. His initial reaction to the news was confusion. Calogheros said the identity of the wandering effigy has yet to be determined. “It has a very feminine face, but masculine hands, masculine body, long hair, no beard and tears. It’s confusing,” she said. While Seymour said he thought the statue may be of St.Pius himself, Calogheros said that according to her records, that saint looks more like a Catholic pope. Because of the strange nature of the case, Seymour suspects that it was a prank pulled by teenagers who may not understand the cultural priority of the church. 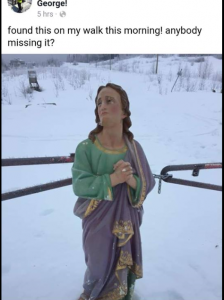 Calogheros said the statue was in good condition other than “a whack on the back of the head,” which they will be conducting a full reconstructive surgery to fix. 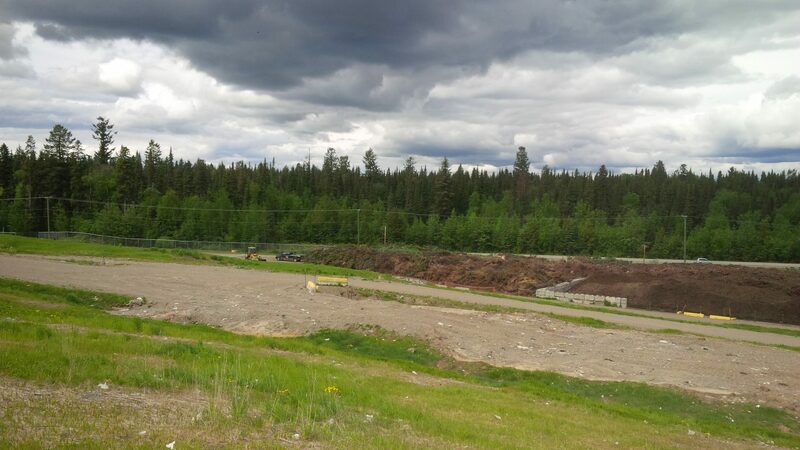 He (or she) is expected to make a full recovery and will be staying with the Museum in the Lheidli T’enneh archives for the time being.